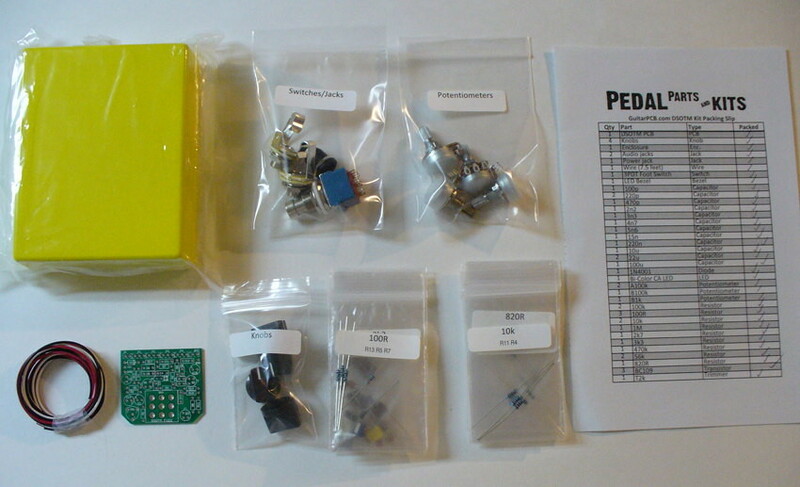 This kit includes all of the parts needed to build the GuitarPCB DSOTM Fuzz project. This is a must-have circuit for any pre-Wish You Were Here era Gilmour fan!!! This is an easy build to get great sound and it’s not fussy about transistor gain. You can go from early Gilmourish DSOTM era to some wild Hendrix Sustain with a twist of the Guitar Volume! Brilliant and very usable dual tone controls. An on-board trimmer allows for more or less Gain. On-Board 3PDT wiring! This kit comes with a BC109C high-gain transistors for the best tone, a 125B enclosure and black Aluminum knobs. Dark Side of the Moon™ and Wish you Were Here™ are a trademarks of Pink Floyd®. Pedal Parts and Kits is not associated with and makes no claims to these trademarks. See our FAQ for more details. Check out these audio demos by Barry at GuitarPCB.com! And this "Crossroads" style demo by T-Diddy!